Professor of social psychology at Aligarh Muslim University. She received her doctorate from the Centre for Advanced Study in Psychology, University of Allahabad. Her research interests pertain to the environment behavior link and how it impacts wellbeing. She is currently researching issues relating to identity, intergroup relations and identifying the barriers and shared spaces between diverse groups which have implications for intergroup harmony. 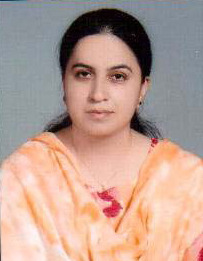 She has worked with international collaborators on projects of significance. Siddiqui, R.N. (2014) The Environment-Behaviour link: Challenges for policy makers. In R.C. Tripathi & Y. Sinha, (Ed. ), Psychology, Development and Social Policy in India. New Delhi: Springer. Siddiqui, R.N. (2011). Appraisal of outgroup in the context of intergroup relations: Role of personal and collective identity. Pakistan Journal of Psychological Research, 26, 2, 167-182. Pandey J., Siddiqui, R.N., Udas A. K. & Rubach, R.B. (2009). Residents reactions to environmental stressors in Kathmandu. A comparison of the inner city versus the outskirts. Psychological Studies, 54, 3, 202-212. Siddiqui, R.N. & Pandey, J. (2006). Gender differences in coping with economic stressors and health consequences. Psychological Studies, 51,2-3, 152-160. Siddiqui, R.N. & Pandey, J. (2003). Coping with Environmental Stressors by urban slum dwellers. Environment and Behavior, 35(5), 589-604. Original generation time 1.7592 seconds. Cache Loaded in: 0.0192 seconds.